Thank You, Leigh Webb and the Mass Bay RRE! 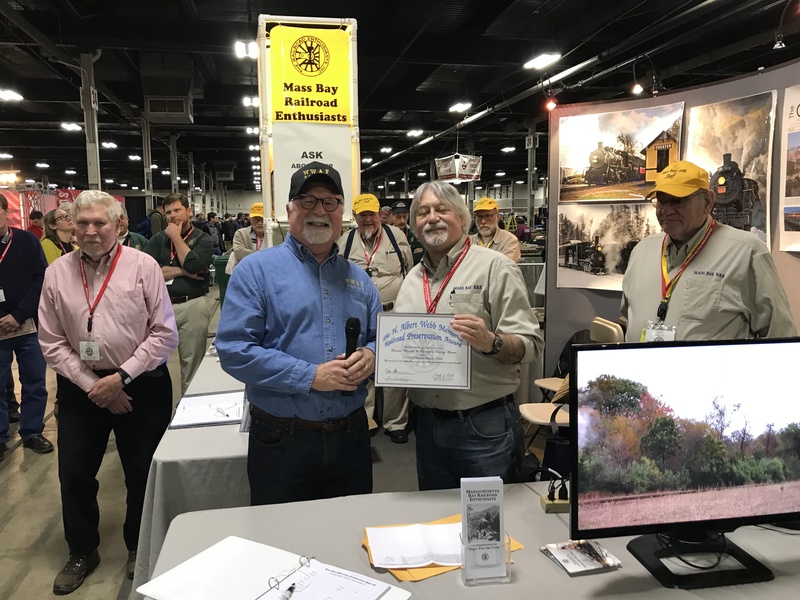 WW&F Railway Museum president Dave Buczkowski (holding a microphone) stands with Mass Bay RRE president David Brown, following the announcement that the WW&F is the recipient of the 2019 H. Albert Webb Memorial Railroad Preservation Award. The $10,000 award will be used for the purchase of track materials and labor for our Mountain Extension. Today the Massachusetts Bay Railroad Enthusiasts announced our Museum is the recipient of the 2019 H. Albert Webb Memorial Railroad Preservation Award to support the purchase of track materials and labor for our Mountain Extension project! The announcement was made at the Amherst Railway Society’s Railroad Hobby Show January 26th at the Big E in West Springfield, MA. The $10,000 grant will greatly aid our push to extend the railway across Trout Brook to Route 218! The Wiscasset, Waterville & Farmington Railway Museum is ecstatic with the interest that the Mountain Extension has received from the entire heritage railway community, and we thank the Mass Bay RRE, and Leigh Webb in particular, for their support of this project. The continued restoration of the WW&F Railway would not be possible without the enthusiasm and excitement among railroad preservationists. We appreciate the long-time support from the Mass Bay RRE which directly fuels the motivation, interest and progress of our volunteers. Previous PostMaine Narrow Gauge and the WW&F Announce an Unprecedented Collaboration!Next PostA Busy February! Special Event! Earth Day Trail Work, Train Ride and Hike at Trout Brook! Special Event! Our Annual Spring Work Weekend!